Laser Modifications of Glass—fabricate crystals in glass using a laser as a heat source and characterize them by various means (Raman spectroscopy, piezoresponse force microscopy, etc.) to gather information for practical applications and more fundamental studies. Computational Nuclear Physics— extract information on the elementary particles that make up objects like the proton by writing code in Python to compute high-energy particle collisions and analyzing how models fit experimental data. We will teach you everything you need to know to do meaningful research. You will learn much and get to know science students and faculty at LVC, all before you begin college in the fall! Are you interested? Please apply using the link to the web-based application form below. Acceptances will be made on a rolling basis. Questions? 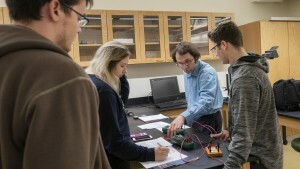 Contact Dr. Daniel Pitonyak, assistant professor of physics, at 717-867-6151 or pitonyak@lvc.edu.